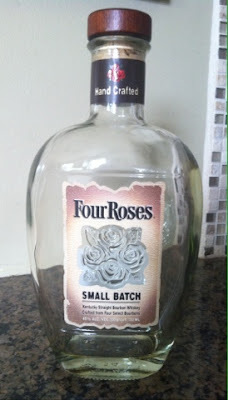 Four Roses Small Batch is one of those bourbons that I've had before, here and there, enjoying a glass at a bar or a pour from a friend's bottle. For one reason or another, though, I had never taken a bottle home from the store (although the Single Barrel has come home with me a number of times). So I felt it was past time that I pick up a bottle and post my thoughts here. Going in I knew that I was getting a bourbon that wouldn't disappoint. It has always been consistently good. Although it's a bit more watery than I prefer, it still holds up with strong vanilla and toffee notes. Perhaps the most noticeable characteristic was that, even at only 90 proof, I found this bourbon to be particularly warming. It certainly had no alcohol burn, and went down very smoothly. Yet, it warmed my insides in a manner that I associate more with spiced rums or even some brandies. That heat was balanced well by its sweetness, neither one being overly so. The sweet caramel tended to linger a while, which was very welcome considering the watery texture. Ultimately, this is an inoffensive bourbon. If I were looking to introduce someone to bourbon for the first time, this is a safe pour. It has all the characteristic traits of bourbon, is not very strong to one end of the flavor spectrum or the other, and is very drinkable. Personally, I think the single barrel is a better bang for your buck as far as the Four Roses offerings go, and I can't wait to continue trying their different single barrel recipes. Nonetheless, this is still a quality bourbon at a relatively modest price. I bought a bottle of this in November. I've had Four Roses standard offering and single barrel, both of which I liked and may compare favorably in their ranges. The small batch, I did not like at all. I found it very rubbing-alcoholish. Neither the nose nor the flavor was anything that I liked. Shame. Interesting, and I agree, a shame. Obviously by my post I didn't get that out of mine. I do prefer the single barrel, however. I was able to grab a bottle of the 2015 Limited Edition Small Batch this Fall, but I haven't cracked it yet. I may do so over Christmas.